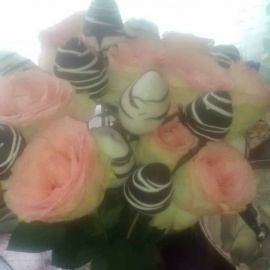 HOLA A TODA LA GENTE BONITA DE MINNEAPOLIS Y SUS ALREDEDORES ESTAMOS AQUI OFRECIENDO NUESTROS SERVICIOS DE ARREGLOS DE FRESAS EN FORMA DE ROSAS, CUBIERTAS DE CHOCOLATE CON DISENOS EN DIFERENTES COLORES Y TAMBIEN BOMBONES CUBIERTOS DE CHOCOLATE..TAMBIEN OFRECEMOS ARREGLOS DE FRUTAS COMO SON PINAS, MELONES, SANDIAS, NARANJAS ETC, ETC, MAS QUE NADA QUEREMOS OFRECERLES ALGO DIFERENTE Y PARA CUALQUIER OCASION Y DECIRLES QUE LAS FOTOS QUE TENEMOS EN NUESTRA PAGINA SON DE LO QUE HEMOS ECHO NO SON FOTOS DE OTROS LUGARES SON FOTOS UNICAS, NO LES VOY A PONER FOTOS DE ALGO QUE NO HE ECHO PORQUE LO MAS IMPORTANTE PARA MI ES SER HONESTA CON USTEDES PARA QUE PUEDAN CONFIAR EN MI TRABAJO, ASI QUE LO QUE VEN AQUI ES LO QUE HAGO, DE ANTEMANO LES DOY LAS GRACIAS POR SU COMPRA Y LOS QUE NO HAN COMPRADO ANIMENSE A PROBAR QUE NO SE VAN A ARREPENTIR. GRACIAS. Say Something or Ask a Question about Arreglos Maribel Santos P.